I am a huge animal lover and always make sure that I do not harm animals in any way. There are many brands that test their products on animals which is purely inhuman. Despite being an animal lover, I forget checking if the particular product I bought is cruelty free or not. When you do online shopping, you rarely get to know if the product is tested on animals or not. Now you don’t need to worry if the product has been tested on animals or not as there is an online shopping website VegetarianShop.in that is dedicated in selling only cruelty free and vegetarian products. VegetarianShop.in is a service from Vegetarian Shop Pvt. Ltd, a vegetarian company dedicated to bring you ethical, vegetarian products. We hope that we can provide a professional retail environment that enables those who make thoughtful choices to not have to compromise. We are confident that we can dispel the misnomer that being vegetarian is too difficult. In 2013 the business was started as Vegecommerce focussed on creating vegetarian online shops (Vegetarian + E-commerce = we can't resist a pun). When we opened our doors in 2013, we were the very first company in India to offer a comprehensive selection of high-quality, affordable, completely cruelty-free vegitarian (non-animal-derived) products on both online and offline channel. It was always a problem in India to find all your Vegetarian needs under one roof. We are providing options of online, on-call and retail mode of shopping! Ever since we've remained true to our goal: to make it easier for people to follow a vegetarian lifestyle by offering the widest variety of quality vegetarian products all in one place. We're the one-stop vegetarian shop! There is nothing more frustrating than having to source groceries from a variety of websites and locations- Allow us to make it easier for you! An account with Vegetarian Shop allows free access to Cruelty Free Shop, where emphasis is placed upon addressing cruelty free and vegetarian friendly needs. Interchange between the online - on call shopping - retail store, shop for yourself, family and others and then check out to have all your groceries delivered in one simple process. We will attempt to continually expand our product range and in store experience to help to make being vegetarian easy and enjoyable. We hope that in the years to come we will be able to provide ethical, eco-friendly vegetarian products and services that everyone can enjoy. Our aim at Vegetarian Shop is making going and staying vegetarian fun and easy! All the products on this site are 100% vegetarian and cruelty-free. VegetarianShop.in is the first online shopping website in India that provides the products that are 100% vegetarian and cruelty free. The layout of the website is simple, neat and user friendly. 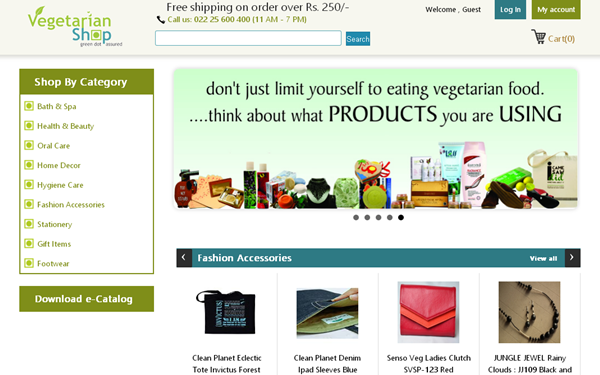 You simply need to register or create an account on Vegetarianshop and you are ready to shop! VegetarianShop.in offers a wide variety of products related to bath and spa, makeup and beauty, hair care, fragrances, oral care, home décor, hygiene care, fashion accessories like bags, jewellery, belts, wallets, footwear, stationery and various gift items. 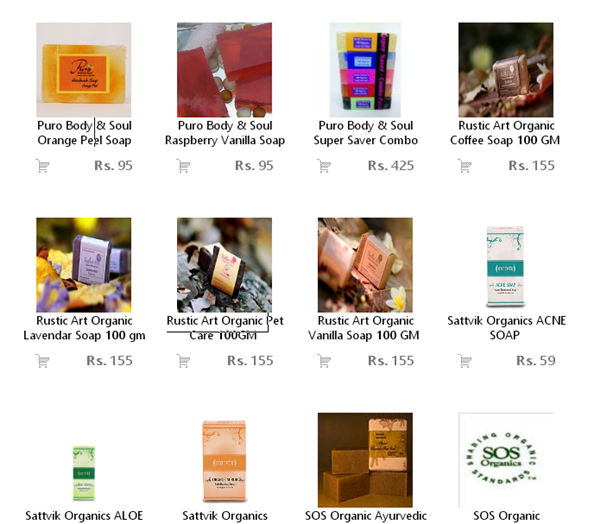 All the products are 100% vegetarian and cruelty free. Being makeup and beauty fanatic, I was thrilled to see lots of brands that are entirely new for me. They have Lotus Herbals, Rustic Art, Organic Therapie, Puro, Nirvaaha, Holy Lama and many more. Let me make one thing clear that all organic/ayurvedic/natural/eco friendly products need not be vegetarian/cruelty free. There are products like bathing soap, detergent powder, toothpaste, cleaners, etc which may contain animal based ingredients, so one should be concern about it. At vegetarian shop, the products are totally cruelty free, without any animal ingredient and not tested on animals. It is also a myth that cruelty free products means expensive, at www.vegetarianshop.in, you will find a range of products from different categories with a wide price range which suits every family. People may be vegetarian or non-vegetarian by their eating habits because of their own belief, religion, health or taste reason, but one can always adopt a cruelty free lifestyle by taking care of products one uses. VegetarianShop offers multiple payment methods for your order: Credit card, debit card and Net Banking. They also provide Cash on delivery and free shipping on all orders above Rs 250. They also have friendly return policy wherein you need to email them to sort out your problem. The orders take 3-5 business days to reach your place (Depends on where you reside!). They keep offering discounts and deals from time to time so make sure you register on their website or follow their FB page. • Free shipping on orders above Rs 250 all over India. • Cruelty free products under one roof. • Provides deals and offers from time to time. • Great and friendly customer service. 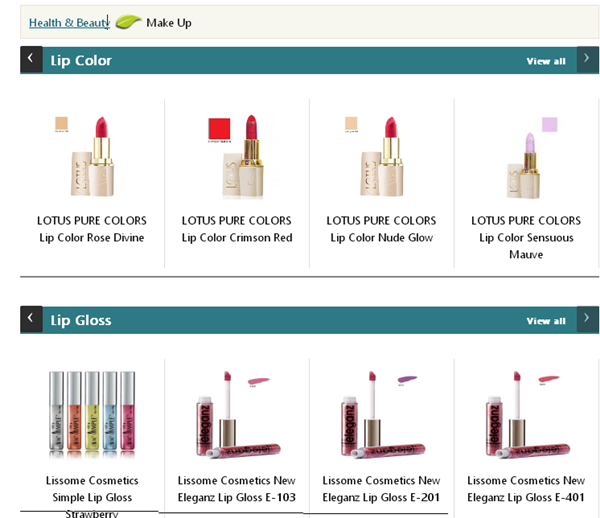 • Does not have wide range of brands in makeup and beauty products. VegetarianShop is India’s first cruelty free online shopping website that provides 100% vegetarian and cruelty free products under one roof. You can shop good affordable brands and get free shipping on orders above Rs 250 which is amazing. By shopping cruelty free, you are helping save animals and increasing the demand for more cruelty products through your purchasing power. If you have a soft spot for animals then you would definitely love VegetarianShop.in! Have you tried VegetarianShop.in? How was your experience? Share in the comments section below!